Appliance Repair Technician Certifications... How Does it Work? How to Receive the Appliance Certification Certificate? What are the Course Standards? Get the respect and career growth you deserve with an Appliance Repair Certification & Certificate. Our Appliance Certification is a highly respected level of professional recognition in the appliance service industry. 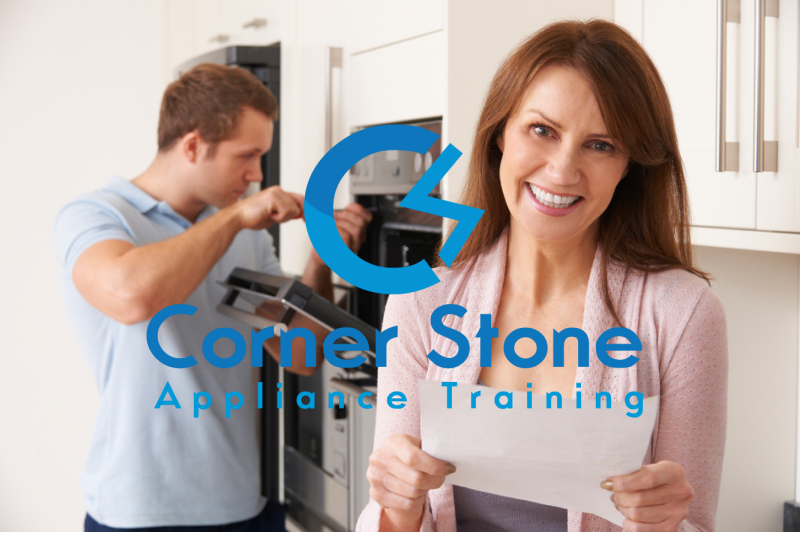 When You Enroll into the Cornerstone Appliance Training Course... Each student will have the opportunity to earn an Appliance Repair Certification Certificate at the Completion of one of our Appliance Training Course(s) or Membership(s). What is the Cornerstone Appliance Certification Exam? 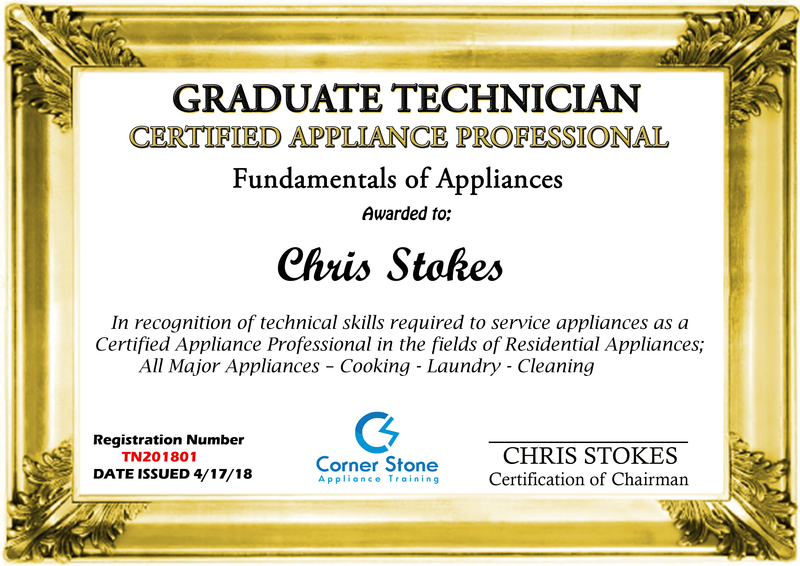 Cornerstone Appliance Training (CAT) Exam is a voluntary certification program for technicians who have taken one or more of our Appliance Training Course(s) or Membership(s) in servicing and repairing major household appliances. Our exams are used to measure whether they have obtained the necessary skills, knowledge & ability to become a competent Appliance Repair Technician. 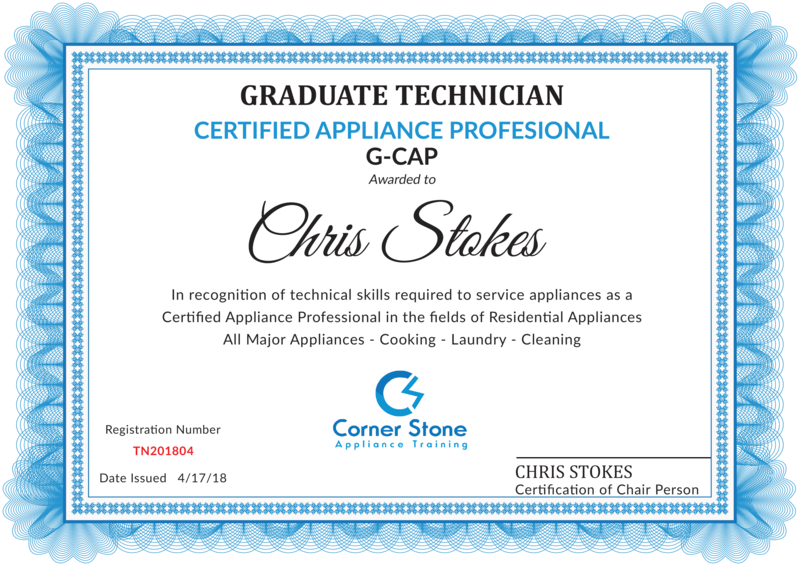 These are the requirements we demand from all of our Graduate Technicians before we award them a Certification Certificate from Cornerstone Appliance Training LLC. All of our Graduate Technician are advised to maintain a Professional Appearance & Competent Skill Set , Professionalism & the highest standard in Customer Satisfaction. At Cornerstone Appliance Training (CAT) you will develop your repair skills with Our Appliance Repair Training Course. Our program will cover how to make both major and minor repairs of all Major Residential Appliances. With CATC, you train at home and at a pace that's right for you, and you can complete the Fundamentals of Appliances Course in as little as 1 to 3 months! Our Appliance Training Course has 8 Modules (Step Videos & Course Materials), at the end of each Training Module is a Practice Exam. The Practice Quizzes & Exams are designed to reiterate what you have learn in that specific module, to ensure you have grasped the information. If you want to receive our Certification Certificate from Cornerstone Appliance Training, then you must achieve an 80% or higher on all of your chapter quizzes. Upon completion of the CAT Program or One of our Training Course(s) you will be given a Final Exam (80+ Questions). You must score a 90% or higher to receive the CAT Graduate Appliance Training Certificate of Completion for your respective course or membership. Cornerstone Appliance requires our students to have been a member of the CAT for 30 days before taking the Appliance Certification Final Exam. You will be given 2 chances within 60 days to retake the exam, if you fail on your first attempt. Anyone that fails to meet the 90% achievement on the final exam, will be required to wait 30 days before retaking any of the aobe Certification Exam. 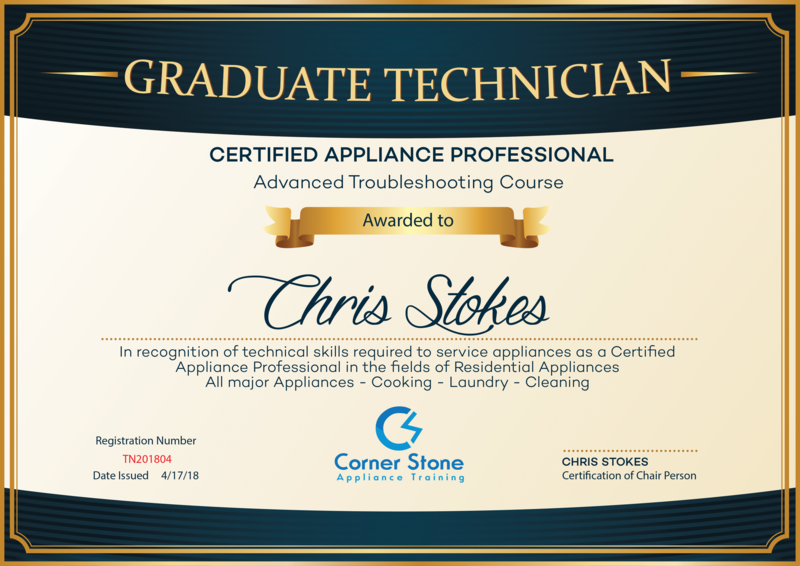 However, any student that desire to take the test within 30 days (determined on a case by case basis), can send a request to Cornerstone Appliance Training. We will look at the practice exams results of your practice test since you have been a member. Appliance Certification only require... a Local Business License to repair Residential/Home Appliances. We do recommend purchasing Appliance Business Insurance (usually only cost about $55 to $65 a month) as well. Don’t worry, we’ll teach you everything you need to know. 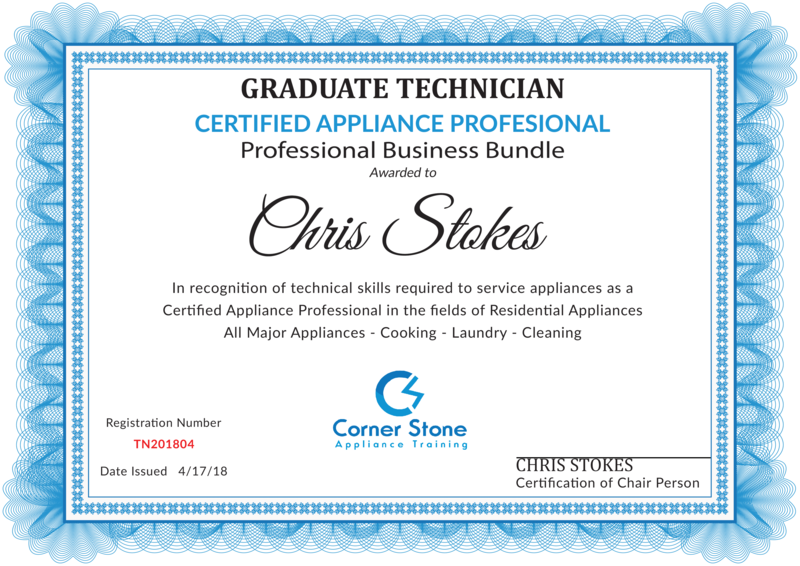 Once you pick up your Cornerstone Appliance Certification, you’ll be ready to Start Your Own Appliance Business or find work as a professional appliance service technician with a skill set that’s always in demand.